Not an #alternativefact , Cavallini almost scored again. Badgers power play ends with nothing to show. Five minutes gone by in the second with the Badgers up one. Jurusik with three turnaways in a row. Jurusik with a couple big saves halfway through the second to preserve the one-goal lead. Badgers up on shots 17-12. Jurusik with another solid game so far. Him & Berry have been playing game of "anything you can do, I can do better" last couple weeks. 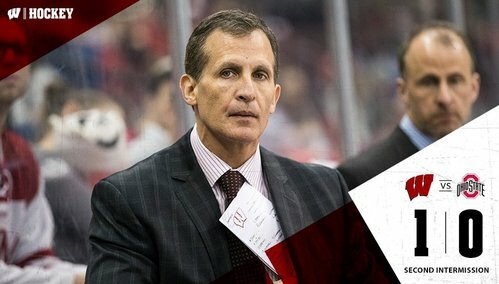 Putting cart before horse, but Granato is going to have quite the decision to make for the postseason. Long tv timeout. When in New York.. The #Badgers still hold a 1-0 lead 10:31 into the second period. UW leading 17-12 in shots. Extracurriculars between Trent Frederic and Matt Miller. Miller shoved him in the face and Frederic's mask came up off his face. UW up 21-12 in shots with 7:48 remaining. Jurusik two unbelievable saves in a row. Sexton headed to the box after a huge hit on McCormick. 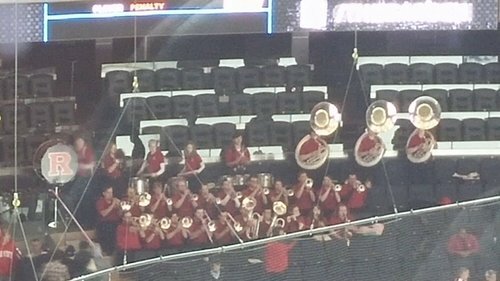 OSU 0, UW 1. Buckeyes heading to the power play after an elbowing call. 5:56 left/2nd. Jurusik has been really good (16 saves), but Ohio State is going back on the power play. UW still ahead 1-0. Buckeyes on the PP at 14:04 in 2nd with Sexton in the box for laying out McCormick at center ice. Elbowing, contact to the head. 2 mins. Sexton with a big hit in the neutral zone but he is whistled for a penalty. Second PK opportunity of the night for UW with 5:56 left. 21-17 in shots now for UW. Nice clear by Greenway with 40 secs left in PP. UW kills the penalty. One shot was all Ohio State could muster. 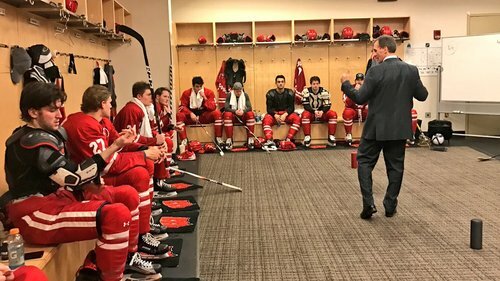 Badgers ice it after teams go back to five-on-five. Kill! Nick penalty-kill by UW and Sexton leaves the sin bin. Under three and a half minutes to go in the first with the Badgers up 1-0. Kill! Nice penalty-kill by UW and Sexton leaves the sin bin. Under three and a half minutes to go in the first with the Badgers up 1-0. Hey, is Coach Daniels wearing his CCHA jacket tonight? Kill! Nice penalty-kill by UW and Sexton leaves the sin bin. Under three and a half minutes to go in the second with the Badgers up 1-0. Hughes with a fantastic block to stop a chance from OSU. Some sweet moves from Zimmer to get into the offensive zone leads to a nice chance for Wagner but he is denied. Under 1:30 to go. Jobst with an excellent point-blank chance, but he didn't get off a great shot and Jurusik made a pad save. 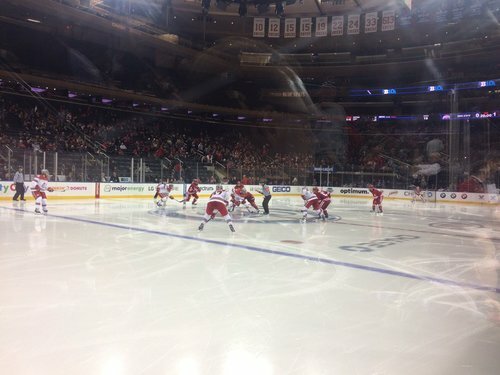 Two period complete at Madison Square Garden: #Badgers 1, Ohio State 0. Period ends with more jawing back and forth between a number of Buckeyes and Badgers. Nothing like chippy hockey. 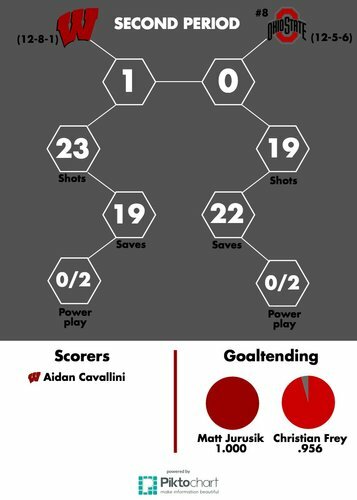 After two, Buckeyes trail the Badgers 1-0. Shots are 23-19 UW. Through box scores I've tracked down, I can't find Gino Cavallini ever scoring at @TheGarden . So his son Aidan seems to have him beat there. Up 1-0. 20 minutes left. Final period is about to begin. UW leads 1-0 and is up on shots 23-19. Third and final period of hockey from the world's most famous arena. Sports!